Fox Chase Elementary School principal Robert Caroselli discussed upcoming school events during a recent Fox Chase Homeowners Association and Fox Chase Town Watch meeting. The Fox Chase Homeowners Association and Fox Chase Town Watch held a community meeting Wednesday, Sept. 13, discussing updates on Fox Chase Elementary School and PDAC Community Day. 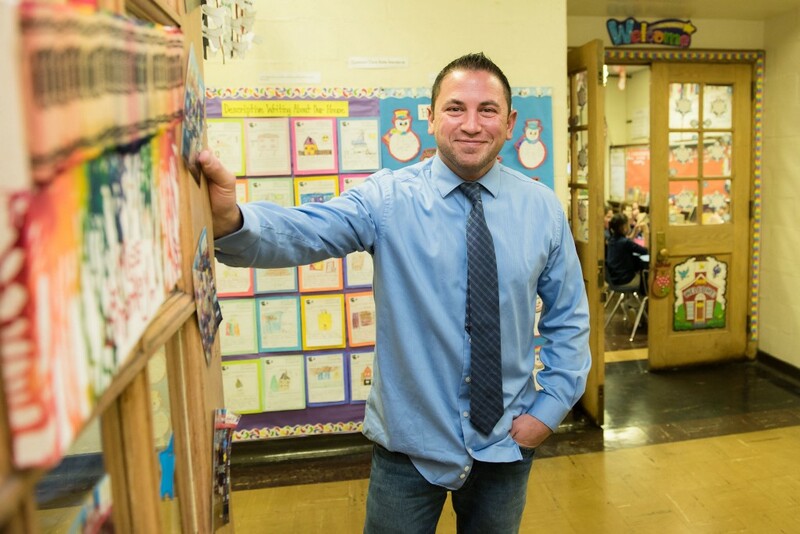 Fox Chase principal Robert Caroselli is enthusiastic about the upcoming school year. “We have a great thing going with our agricultural program, that’s our niche,” he said. Students are able to get hands-on experience at the Fox Chase Farm from the state’s first agriculture certified teacher. “Agriculture is the №1 economy in the state of Pennsylvania,” Caroselli said. He said by the time the kids graduate, there would be plenty of jobs in the field. He also said every student is required to take two piano lessons a week starting in the second grade. Technology like iPads in the classroom enable them to learn programs like GarageBand, an audio recording application, starting as early as kindergarten. Caroselli called upon the school parents of the community to make their voices heard. He cited the school as one of the lowest-funded in the Northeast. The meeting also discussed the second Police Advisory Council Community Day, which took place Saturday, Sept. 16. The event was sponsored by the 2nd Police District Advisory Council and 2nd Police District. Town Watch donated $300 toward the event. The event, which happened at Fox Chase Elementary School, kicked off with a community bike ride that gave away eight donated bikes and helmets. The event also provided VIN etching onto cars, which prevents chop shops from stealing glass. Residents could bring old paper clutter to get it shredded. Councilman Brian O’Neill said a parking lot at Burholme Park is nearly finished and encouraged neighbors to get the word out. 2nd District Police Officer Mark Mroz said protests in the city have left the police understaffed in areas such as Fox Chase. He said responding to incidents such as juveniles drinking in a park have less priority than more pressing reports. He encouraged residents to call for incidents — not just one person, but every neighbor who may be impacted. Seniors can get a free SEPTA pass at the Free Senior SEPTA Pass Day and Fair, happening Friday, Sept. 22 from 10:30 a.m. to 1 p.m. Seniors must be 65 years old and bring photo identification or a birth certificate. It will be located at the Northeast Regional Library at 2228 Cottman Ave. The event is free and no registration is required. An update on a proposed Pennypack trail extension will be given at the November meeting.